China has announced the Sunway TaihuLight – the world’s fastest supercomputer, with a Linpack rating of 93 petaflops and peak performance of 125 petaflops. The Sunway TaihuLight is the first system in the world to reach a peak performance of over 100 petaflops (100,000,000,000,000,000 floating point operations per second). 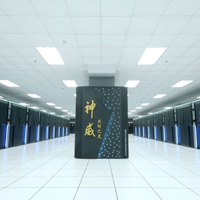 It is a completely home-grown machine, designed and operated by the National Supercomputing Centre in Wuxi (NSCC-Wuxi), eastern China. As the world’s fastest supercomputer, it will contribute to research such as Earth system modelling, ocean surface wave modelling, atomistic simulations, phase-field simulations, hi-tech manufacturing and big data analytics. With advancements in these and other fields, the models that scientists use are becoming increasingly complex, and the temporal and spatial resolutions they require are also increasing rapidly. All of these factors contribute to the demand for exponential improvements in computing power. The Sunway TaihuLight is three times faster than the previous record holder, Tianhe-2, which ran at 34 petaflops. In fact, it actually surpasses the next five machines on the TOP500 list combined. It has a total of 10.6 million CPU cores and features 1.3 petabytes of RAM. The system is so powerful that it requires about 15 megawatts (MW) of electricity. However, this is actually less than the 17.8 MW needed by Tianhe-2, making it far more energy efficient. The system runs on its own operating system, Raise OS. “As the first number one system of China that is completely based on home-grown processors, the Sunway TaihuLight system demonstrates the significant progress that China has made in the domain of designing and manufacturing large-scale computation systems,” said director of the NSCC, Prof. Guangwen Yang. China now has more supercomputers among the world’s top 500 than any other nation. Although lagging behind in the supercomputer race, America is planning to launch a new machine of its own in 2018 called the Summit that should run between 150-300 petaflops. By 2019, experts believe the first exaflop computer may arrive. Longer term, zettaflop and yottaflop machines could arise in the 2030s and 2040s, respectively. If trends continue, a billion human brains could be simulated in real time by the ۲۰۵۰s.